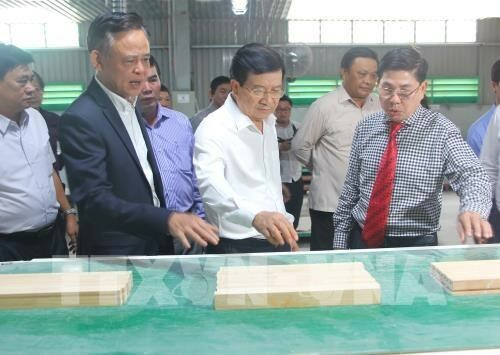 Binh Dinh (VNA) – Deputy Prime Minister Trinh Dinh Dung has ordered tightening the control of changes in the use of forests while strictly enforcing the closure of natural forests at a conference of the steering committee for sustainable development of the forestry sector. The steering committee for the national target programme on sustainable development of the forestry sector (Programme 886) held a conference in the central province of Binh Dinh on March 29. Deputy Minister of Agriculture and Rural Development Ha Cong Tuan reported to the conference that the forestry sector had achieved or overfulfilled all set targets in 2018. The national forest coverage expanded by 0.2 percent from the previous year to 41.65 percent, with 231,520 ha of concentrated forests planted, surpassing target by 18 percent. Total forestry production value exceeded 32 trillion VND (1.38 billion USD). There are around 4,500 enterprises operating in processing wood and forest products, with 1,863 of them directly involved in export. Vietnam’s wood products have been exported to 120 countries and territories, with main markets being the US, Japan, EU, China and the Republic of Korea. The forestry sector earned 9.38 billion USD from exports in 2018, up 15.9 percent year on year. However, many problems remain, such as deforestation and illegal transport and storing of forest products, which are attributable to the poor performance of local authorities, especially those in the northern provinces of Dien Bien and Bac Kan and the Central Highlands. The northwestern and central highlands regions have large areas of forest land but the pace of forestation in those regions is slower than in others. The planting of protective and special-use forests faced great difficulties due to the shortage of capital and land. According to Dinh Ngoc Minh, deputy director of the Agriculture Department under the Ministry of Planning and Investment, after three years of implementation, four out of the 16 tasks set by Programme 886 have been completed two years ahead of schedule, five other tasks have had 90 percent of the workload done and the remaining seven are being conducted on schedule. The Ministry of Planning and Investment has asked the Government to instruct local administrations to allocate sufficient capital from the central budget and mobilize investment from other legal sources for projects in forest protection and development.